Start your South India Temple tour with the arrival at Madurai Airport/Railway station where one of our representatives will receive you and help you to get transferred to the pre-booked hotel. After some rest visit to see the famous Sree Meenakshi Amman Temple, Thirupparankundram Murugan Temple, Koodal Azhagar Temple etc. Later return back to the hotel for dinner and overnight stay. Post breakfast leave for Rameshwaram which is among the most sacred temples of South India. It is located at a distance of 176 Km from Madurai. Upon arrival, check into the pre-booked hotel and freshen up. Later, visit the Ramanathaswamy Temple which has 22 holy springs which are believed to have medicinal properties. Also visit the Jada Tirtham, Dhanushkodi Temple, Gandhamadhana Parvatham and Five Faced Hanuman Temple etc. Return back to the hotel for dinner and overnight stay. After a delicious breakfast check-out from the hotel and proceed towards KanyaKumari which is around 298 Km from Rameswaram. Upon arrival, check into the pre-booked hotel and take some rest. Later on, visit the Sri Kumari Amman Temple Suchindrum, Padmanabhapuram Palace, Thiruvalluvar Statue. 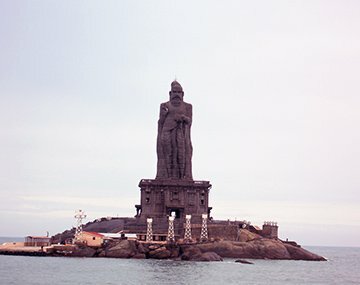 Then hire a boat to visit the Vivekananda Rock Memorial and enjoy the visuals of mesmerizing sunset. Return back to the hotel for dinner and comfortable night stay. After breakfast, check out and transfer to the Trivandrum Airport /Railway station for your onward journey. The South India temple tour package takes you to the most revered temples and shrines of the southern part of the country. These masterpieces represent the architecture splendour, craftsmen spirit and excellent work of engineering. They have various styles of construction and rich legacy of the region ruled by various rulers who had contributed to the rich cultural heritage of the country. BookOtrip helps you to visit the most exquisite places in the world. We help you to visit and explore the rich cultural heritage of the countries, their hot spots and various other places of interest packed in one itinerary so that you can get the glimpses of all in one. So don’t delay, just pack your bags now. Visit to Kanyakumari and Rameshwaram was very peaceful. Arrangement done by BookOtrip was very appropriate. Thanks BookOtrip !!! !